True confession: I didn’t finish my dinner last night because I was too full from eating a thousand green beans. And the kicker? I don’t even like green beans. Too rubbery. Or worse, mushy. That was when I realized that Sarah had slowly transferred her ENTIRE PILE of green beans onto my plate when I wasn’t looking. *Shakes fist* I’ll get you for that one day Sarah, just you wait! 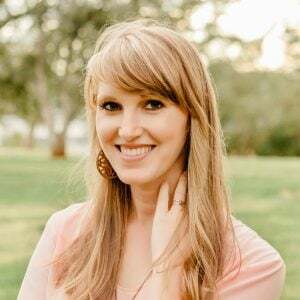 Lori from Recipe Girl (have you been to her blog? Go. Now.) mentioned yesterday that there are only 13 days left until Easter. Today it’s 12. You know what this means? The clock is ticking! Only 2 weeks left of Reese’s Eggs and Sweet Tart Jelly Beans, guys. I’m officially in emergency mode. Easter candy makes the world go round. But it also means that it’s time to start figuring out our Easter menus. Are you guys traditional ham people? Lamb and mint? Or just deviled eggs all the way? I finally changed up my sidebar over on the right and added a bunch of Easter food recipes to get your brains going. Check it out. 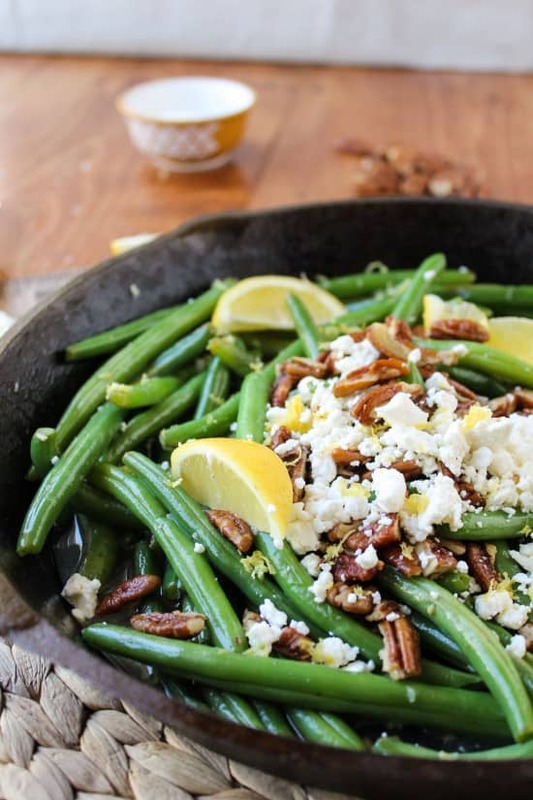 I’ll be adding this recipe for Lemon Green Beans with Feta and Fried Pecans. I should have named it The Recipe That Made Me Like Green Beans. I think there’s something in feta you guys. Perhaps an addictive chemical that makes you crave it fortnightly? This recipe is not too far off from Broccoli with Feta and Fried Almonds, also known as The Recipe That Made Me Eat a Pound of Broccoli In One Sitting. I wanted to try it with green beans, just to see if it would make me like them. It totally worked. I added lemon instead of vinegar and love the brightness that it adds. 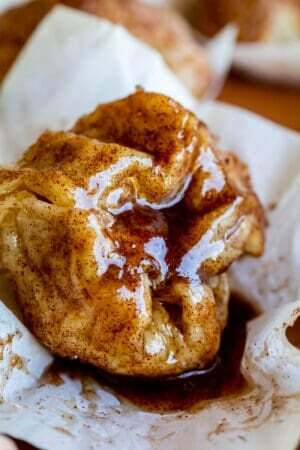 The fried pecans put it over the top. You should fry some extra and just eat them…so good. Use the side of a chef's knife to crush the garlic. 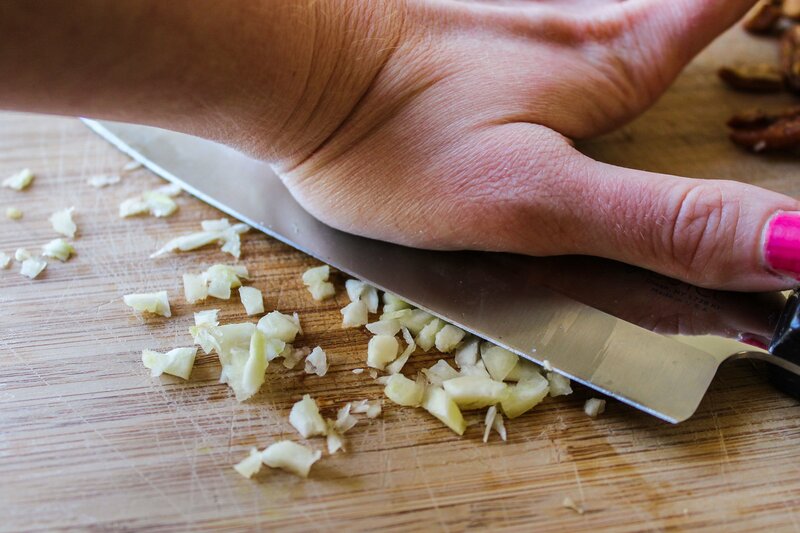 Mince it finely, then crush it again with the side of the knife. (If you have a mortar and pestle, you could use that.) Place the garlic in a small bowl and add 1/4 teaspoon salt. Mash it together with a fork. 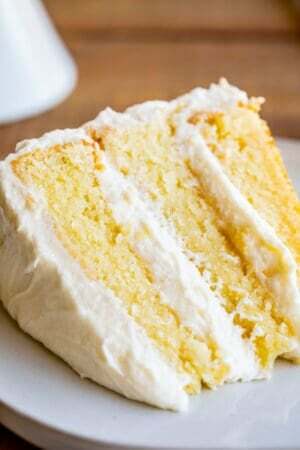 Add 3 tablespoons fresh lemon juice and set aside. In a small skillet heat 1 tablespoon olive oil over medium heat. 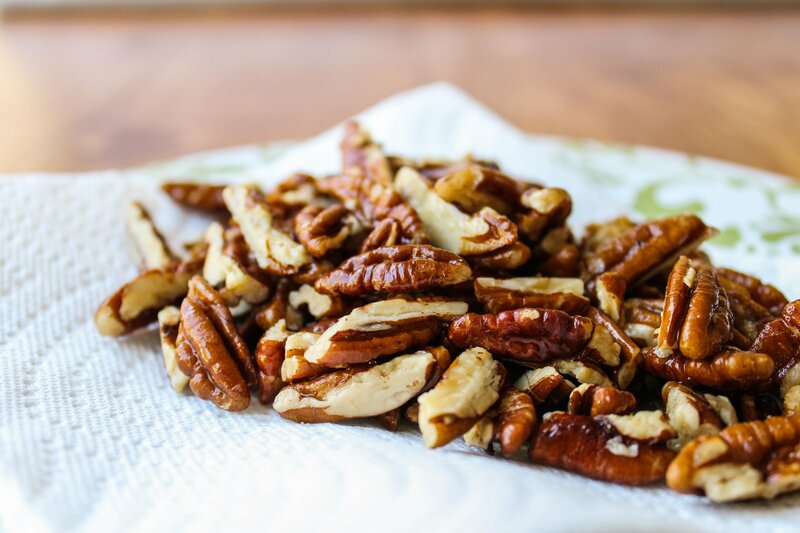 When hot, add the pecans. Cook for 5-6 minutes, or until they are nutty and fragrant. Remove to a paper towel lined plate, sprinkle with a little salt, and set aside. In a large pot, add about 7 cups of water and 1 tablespoon salt. Bring to a rolling boil over high heat. Add the green beans, cover, and set a timer for 3 minutes. Drain the green beans into a colander and rinse with cold water. Meanwhile, heat 2 tablespoons olive oil and 1 tablespoon butter over medium heat in a large skillet. When it is hot, add the rinsed green beans. 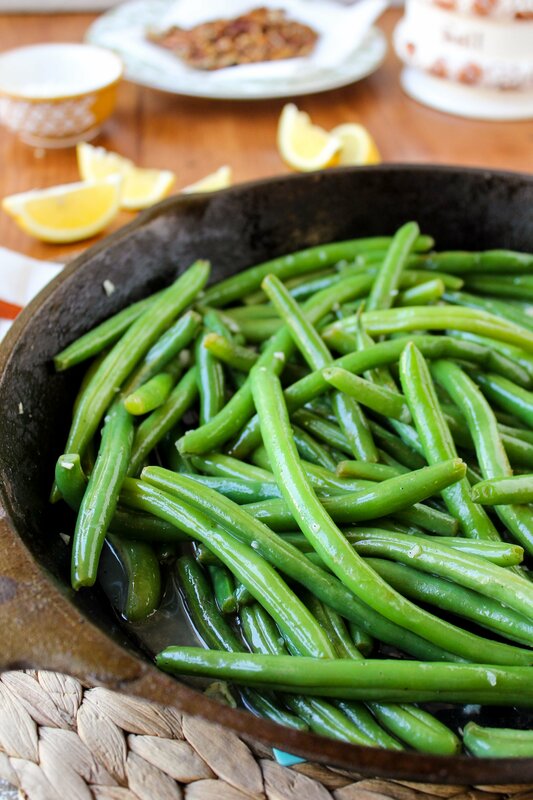 Saute for 5-6 minutes, or until the green beans reach the crisp-tender level that you want. Remove from heat and add the lemon-garlic mixture. 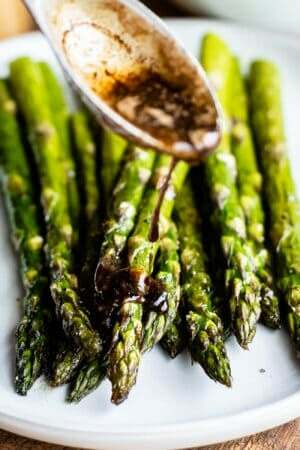 Season with freshly ground pepper to taste. Toss in the pecans and the 1/2 cup feta. Serve with extra lemon wedges and lemon zest to garnish. This recipe was inspired by this Broccoli with Feta and Fried Almonds, which was originally found on Kalyn's Kitchen. Smash up that garlic. Show him who’s boss. 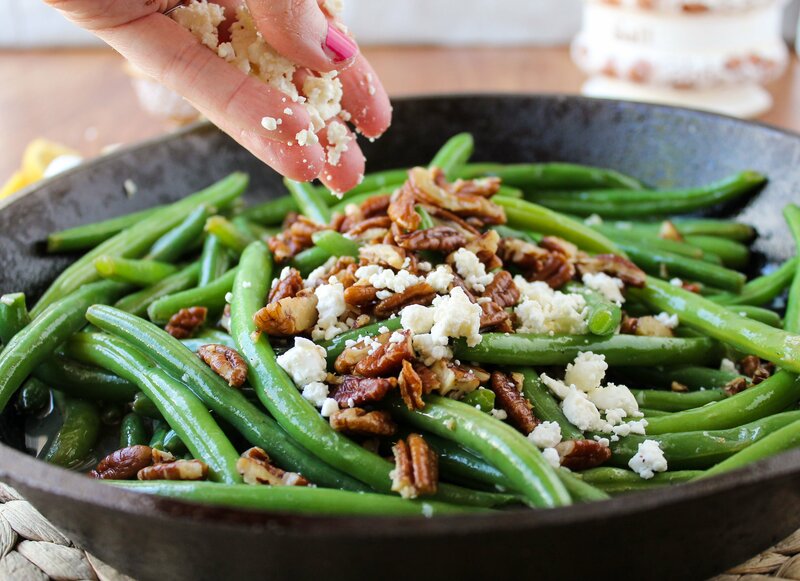 The green beans should look like this when they are crisp-tender. Bright green and lovely. Add the pecans and feta. And don’t forget the lemon zest. 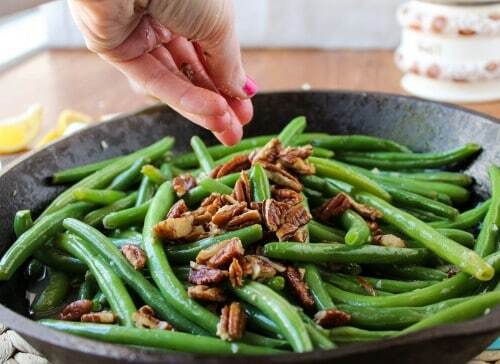 Oh my goodness, these green beans! 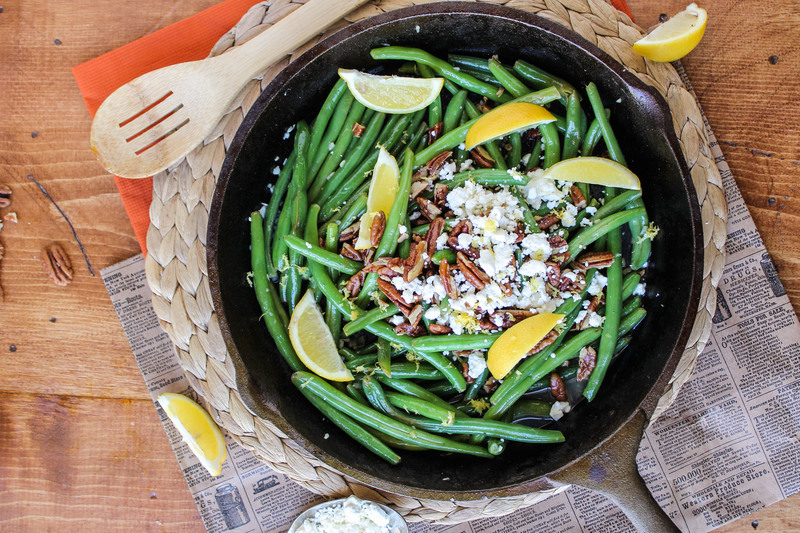 We eat green beans as a side dish all the time … but not like this! Feta, fried pecans? Yes and yes! Fried pecans?? Hello! These sound amazing! This looks gorgeous Karen! I’m all about new twists on veggies. I LOVE green beans and these look awesome! The pecans are blowing my mind! Now your’re a green bean lifer chica. Absolutely head over heels for these. Feta, yes. Fried pecans, yes. Just yes. Oh, I can totally see why this is the recipe that made you love green beans! It is so bright and cheerful and fresh (I was turned off by green beans as a kid because of the gloppy green bean casserole we had–but now I love them since I’ve started using fresh ones :). Haha, I have so pulled that same trick with friends and family! My ultimate food trick was when my fam was eating at a breakfast buffet place and I grabbed my brother’s muffins and hollowed out the centers from the bottom. He was SO confused but we convinced him that it was just how this particular restaurant served them and that it was convenient for putting jam or butter in. Ha! Aaaanyhow, I’m always looking for new ways to appreciate my veggies, this looks like an awesome Easter dish! 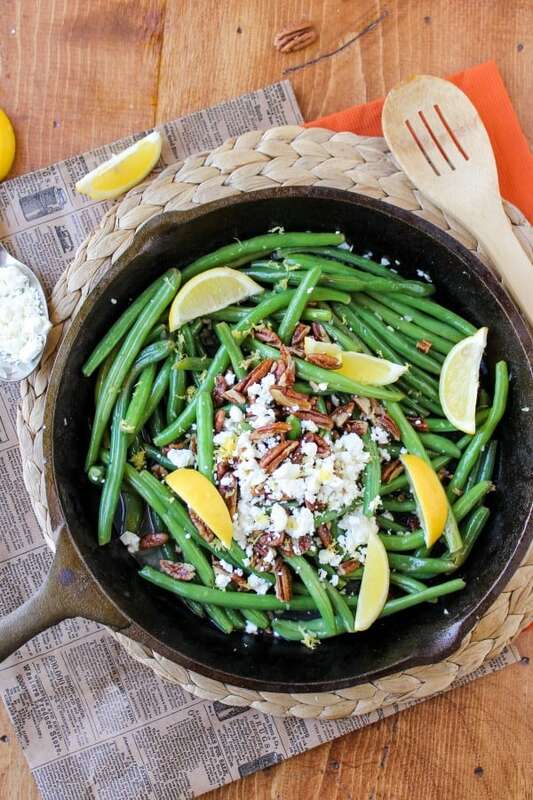 What a delicious way to get your green beans in! I definitely must try this recipe..thanks Karen! How will you get back at me? I love fresh green beans now. And I even are my green beans in the hospital when I had Emmaline. Unwatched. Uncoerced. I’m the green bean shark. the green bean shark, lol Sarah. PS it will come when you least expect it. I bow down to Sarah’s stealthy ninja skills in getting you to eat her pile of disgusting green beans. When cooked right, I LOVE them. They’ve gotta be crispy. Mushy or rubbery is a no go in my world. Your version looks delish, Karen. I don’t eat feta (please don’t ban me from your site or stop being friends with me!) but I’d gladly ‘n gluttonously eat everything else on this plate. Beautiful photos too. I couldn’t make green beans look this gorgeous in a million years! Love it! You did green beans justice. I bet they’re grateful and really glad you’re friends now. So pretty and fresh Karen! Time to move on from the old green bean casserole I’m thinking! 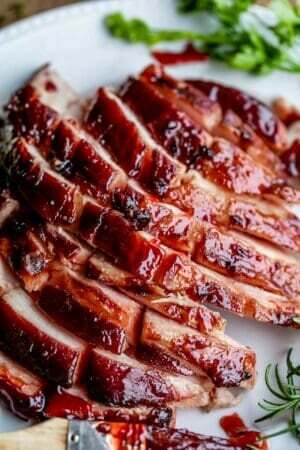 This recipe is perfect for Easter. 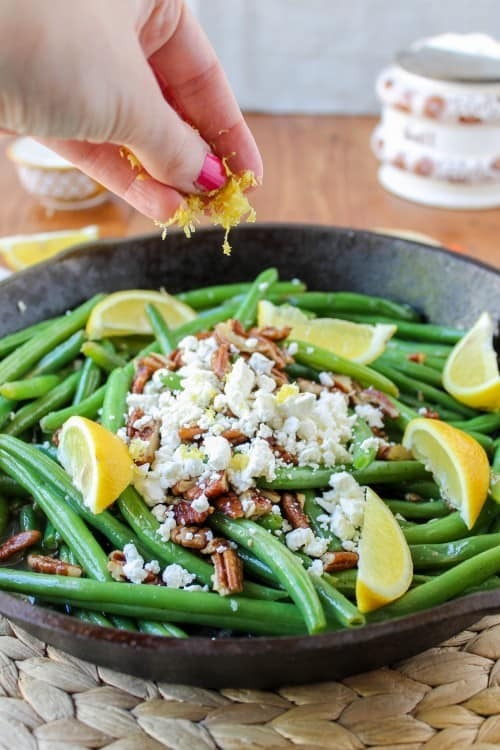 Lemon and green beans are a match made in heaven!! Whenever I make them, I literally eat about half before I even get them to the table. It’s an addiction. And then I eat the other half because my family doesn’t share my enthusiasm for perfectly cooked green beans with lemon and butter and salt and pepper . . . YUM. I totally laughed out loud at your college story. Sounds like Sarah had the right idea. ;) I would definitely finish my plate of green beans if I knew that I was eating THESE beans! They’re totally gorgeous, Karen! 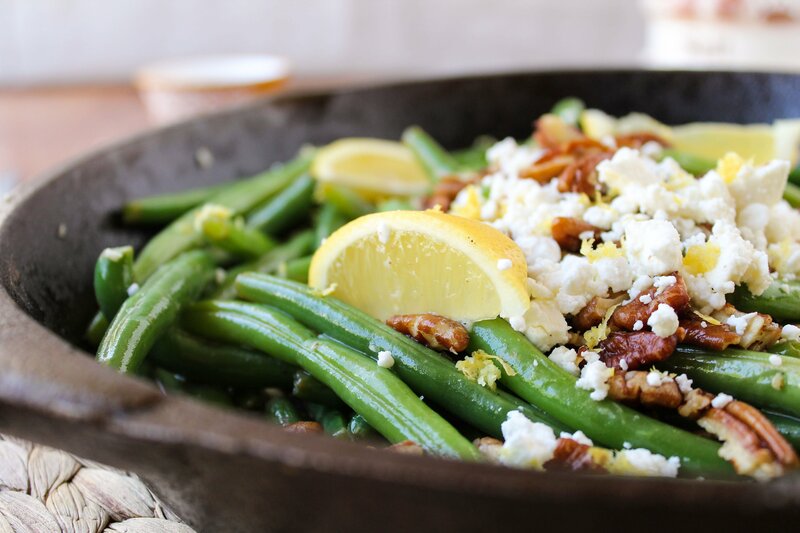 I love love the combo of feta and toasty pecans, and lemon zest sounds like the perfect finishing touch! Gorgeous photos! pinned. Hi Karen, I believe these would convert anyone out there, they look amazing. Great presentation and pics!